Many families rely on an optician to decide what shape, size, color, material and lens options to choose for their child’s glasses. Sometimes this works out well, and sometimes not. Often, the child receives ill-fitting glasses that don’t look well, constantly slip down, are too thick and heavy, or are way too big for their face. Know your child’s eye glasses prescription. The higher the prescription, the more important it is to understand how the prescription affects the frame choice. With a high prescription, and the wrong frame, the lenses can become very thick and heavy, and have visual distortion. Ask for your child’s pupillary distance measurement, PD. This is the distance in millimeters between the center of the pupils in each eye. The PD is used by the lens lab to center the prescription on the optimal spot in the lens for your child’s eyes, and therefore an oval or round frame works best with high prescriptions. In correctly fitting glasses, the eyes will be centered both horizontally and vertically in the lenses. ​It can be difficult to find a frame that is an exact match. Get as close as you can with the frame + bridge numbers to the PD. Each eye should be a max of 3 to 4mm off-center in the frame, therefore, frame size + bridge size should be no more than 8mm > PD. Note that the lenses will get thicker for each mm off-center. These glasses have an eye size of 46, a bridge size of 16, and a temple length of 125. They are ideal for a PD of 62, but could work for someone with a PD between 54 and 62. Is Frame size + bridge size - PD <= 8 ? ​ 46 + 16 - 47 = 15 Therefore, these frames are way too big. In this example, each eye and each lens would be 8.5mm off-center. ​Now evaluate another frame, which has 38-14 on the inside of the temple. 38 + 14 - 47 = 5 Therefore, these frames could work well. 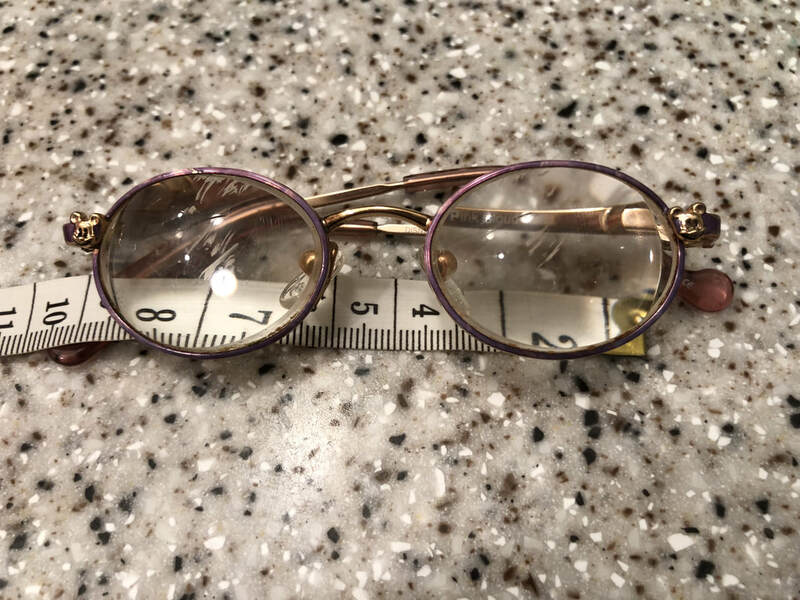 The stronger the prescription, the smaller you want the lens to be, and therefore choose the smallest round frame that fits. Try on a pair of glasses from the previous step. Check that the glasses are not too tight, nor too loose on the face. Check the nose bridge. If too tight, the bridge will pinch your child’s nose. If too loose, the glasses will slide down. Options for the bridge are saddle bridge versus nose pads on the bridge. Many young children find a saddle bridge more comfortable than nose pads. Check the temples. They should go straight back to behind the ears, and not overshoot the back of the ears. Check if your child’s eyes are centered both vertically and horizontally. Remember, for a high prescription, choose the smallest frame that will fit, to limit the thickness and weight of the lens. DO NOT allow for growing room. Your child’s glasses need to fit now, not next year. If there is more than one frame that works for your child, allow your child to pick which one they prefer. Glasses are important, they will become an integral part of your child. Your child will have a sense of style. Involve them in the process, and they will enjoy wearing them! These are Sarah's latest glasses, a prescription of +16.00. With a small PD for her age, of just 53.5, it is very difficult to find glasses that fit. These are at the outer limits of acceptable, with an eye size of 41 and a bridge of 20 = 61, which is 7.5 more than her PD of 53.5. Therefore, each eye is off-center by 4mm. These glasses fit her head well, and the temples are not bowed. The lenses are wonderfully thin and clear. For young children, polycarbonate lenses are recommended as they are impact-resistant. There is a high-index polycarbonate lens available. For high prescriptions, ask about the thinnest lens available for your child. It is worth the extra charge for an anti-reflective coating. Photos will come out much better, and your child’s vision may also be sharper. If your child’s prescription is within the range of transition lenses, that automatically turn darker when exposed to sunlight, these are worth the additional cost. Consider ordering a separate pair of sport goggles at the same time, such as RecSpecs, if your child plays impact sports. These are Sarah's very first teeny tiny glasses that she got at just a few weeks old. The lenses are +32.00. We kept them on her with a band that went around her head.